My old friend and songwriting mentor, hall-of-fame songwriter Dave Loggins, once chided me that I was writing like a spectator instead of a participant. He was right. I took his advice, dove down deeper and came up with a song I wrote from the center of my soul. It was like automatic writing... I wasn't sure if I wrote it or it wrote me. It was called "Hands On Matter". Can I tell you, this song was different... and so much more moving to listen to. Later I would use that advice co-writing, among many others, the #1 song "One Way Ticket" with Keith Hinton. Well, there is a similar choice you get to make when you sing. Dare to get in touch with the real message and story you're singing. Or ask yourself why you can't. The answer(s) may well lead you to become a more complete human being. Singing: it's not for the squeamish. 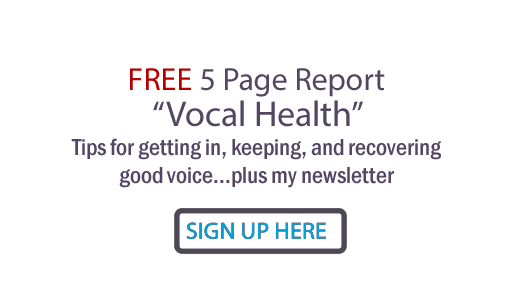 Power, Path and Performance vocal training combines breath, throat and communication techniques for the total max vocal performance. Find it here. Running Out Of Breath Singing?